We can get so caught up in the hustle and bustle of the holiday season that we often forget to think of others. Even the smallest thoughtful gesture can make someone else’s day. Plus it can also make you feel good! So why not brighten the world around you and participate in a few random acts of kindness today? We are healthy, happy, clothed, fed, and loved. We have more than we need, and enjoy each other’s company. We are preparing for the celebration of our Savior’s birth & looking forward to a season of rest. We are learning to appreciate what we have, and share our blessings with those who are not as fortunate. We are also learning to be more purposeful in cultivating a servant’s heart – all of us: me, Barry,Jennifer, Noah,Abigail and Jessica. This holiday season wouldn’t it be wonderful to serve those around you by performing their random acts of kindness and no one knew they did it? And yes, just thinking about it makes me get the warm fuzzies! I hope you did too. Christmas is less than a week away and I know that many of you are stressing out about getting the perfect gift, cooking an amazing meal and wearing the right thing but, that’s not what this season is about! The past few days I have been gently reminded that this is a season of “Hope, love and Joy” . I don’t see any reference to overspending, selfishness and stress do you? Give colouring books and crayons to the kids section of the hospital waiting room. Offer a homeless person lunch and dine with them. Collect coats to donate (you can even leave them done up on lamp posts). Send some Christmas cards to soldiers. Run out on trash day with warm cocoa and a gift for our trash collector. Tape a treat and a card to our mailbox for our mailman. Host a few “playdates” so parents of our kids’ friends can go Christmas shopping in peace. Visit the kids’ pediatrician and bring cookies for the whole staff. Be a Snow Angel and shovel your neighbours sidewalk. Leave hats and mittens on Park benches for the homeless. Pay for the person behind you in the drive thru. Bring coffee and doughnuts to the firehall. Bring board game and visit the seniors Lodge. Donate toys and clothes to a shelter. Donate food and toys to the animal shelters for the dogs and cats, and pet a few. pack a gently used purse with hand lotion, lip gloss, hair brush, tooth brush, clean underwear and sanitary products for a homeless women. Fulfill an Angel tree request. Candy can bomb a parking lot. Let someone else go ahead of you in line. 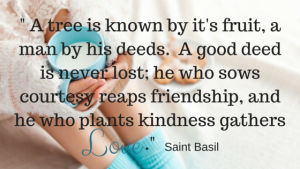 What will your first random acts of kindness be this holiday season? you’ve remind me that I need to drop off some of the toys I’ve received. Mery Christmas and happy holidays to you and yours. Love you list! I think it is so important for our kids to see us helping others. It really is the simple things that matter – it’ll be a huge impact. We donate to Toys for Tots every year and pick a child from a local charity my job is associated with. I bring my kids along to shop and donate. This holiday season I am planning to round up all the donation stuff from each of the rooms of my home. I have a donation box ready and the scheduled time for pickup. In the past year I have written out Christmas cards to close family and friends that in lieu of a gift I would make a donation to a charity that I selected under their name. I am hoping to do this again next year. I love reading posts like this! It is too easy to get caught up in the gifts and forget about the most important parts of the season. My first Random Act o f Kindness this holiday season was watching my nieces and nephew while my sister-in-law was busy wrapping away. I helped and got to spend fun time with them. A win for all. YES! Spreading kindness is so important! I love the ideas you shared, especially reading to a child in an after-school program, you’re benefiting the child with time to learn but most importantly showing the child you care, which is what REALLY matters! This is such a great post full of amazing ideas to do. I will pass these along to my husband as well. These ideas are not only practical to brighten someone’s day, some are really fun too! Love the Candy Cane bomb! That would be too much fun. This is list is great! I remember buy gifts for an Angel tree with my mom when I was little. And I’m definitely going do #16 more often. It’s so simple but is sure brighten someone’s day! I love your list! There are so many easy ways to make a positive impact on someone’s day. I’d love to brainstorm some ideas with my kiddos for them to do this week also. Those are all wonderful ideas. I stop at McDonald’s for breakfast every morning and every time I’d win a free food item on their NFL giveaway I would give the coupons to a homeless person so that they could use them to get a little food. I’m totally going to leave some extra quarters in our building laundry room. What a great idea! I would have never though of that! It is so nice to find a surprise like that. I know it would certainly brighten my day! This is a great list. 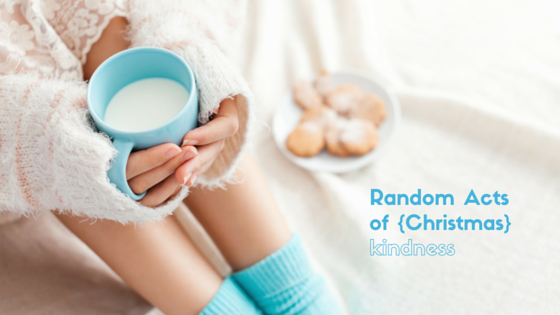 I love random acts of kindness, and think it’s so important to practice them all year long. I love your hat and mitten idea for the homeless. That is really thoughtful and sweet! These are great selections. This is very convicting, I think sometimes we get so caught up in what we need to do to get done that we forget others. Thank you for the reminder. Beautiful post! I agree we are called to serve and it is important to give to others/help others. I love these ideas! I can’t wait to try some of these with the kids. It’s never to early to learn about giving back. Our kids are all older now, so we “babysit” for young families who need sitters to be able to get the shopping done. It’s fun to bring littles into our house for an evening and give young parents a few hours to shop without stress. Really nice ideas. It can be hard to find the time, but volunteer work can makes such a difference. Random acts of kinds are always nice to see and nice to partake in. The other day, I saw two different people pay for other table’s food at a restaurant I went to. Love this list, Heather. #16 is one of my favorites, as once you start, it keeps going! Instead of gifts and presents, an attitude of gratitude and acts of kindness can go a long way in teaching our children about what matters. Keep up the good work!